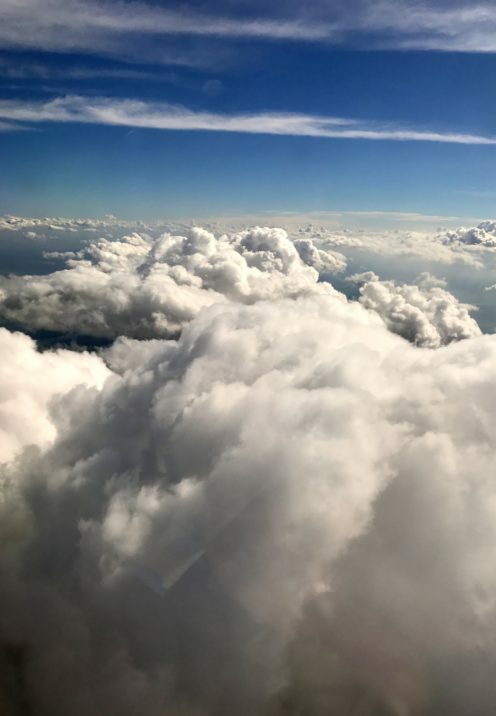 It was a beautiful day above the clouds as our Delta aircraft approached Budapest, Hungary. 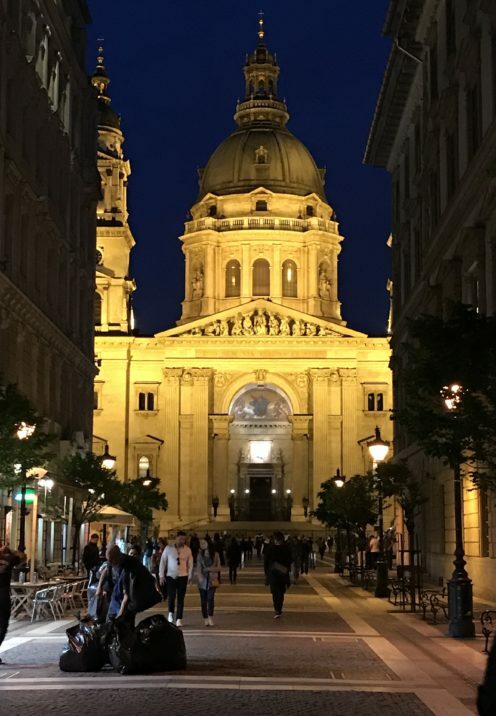 This would be my first trip to Budapest, a city that was only liberated from communism in 1989. 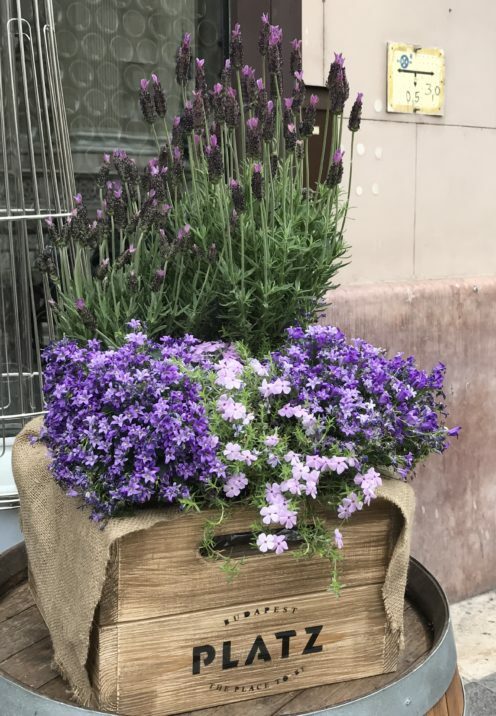 So today I am delighted to be exploring enchanting Budapest with you. 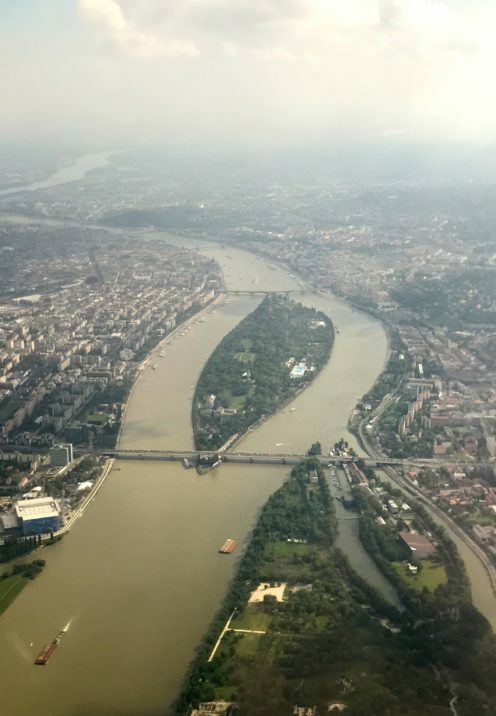 It was exciting when the Danube River came into view, as after a 4 day stay in Budapest (pronounced BOO-dah-pesht) we would be embarking on a Uniworld River Cruise down the Danube. And as you can see, the idea that it is “Blue” is simply not true. 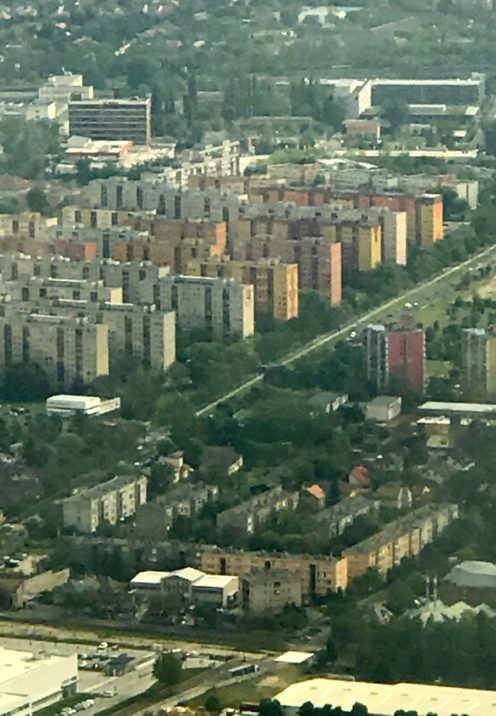 After spending the bulk of the flight reading Rick Steves’ book entitled Budapest, I was intrigued when old Soviet era high-rise housing came into view, as I had read much on the subject in Rick’s very informative travel guide. 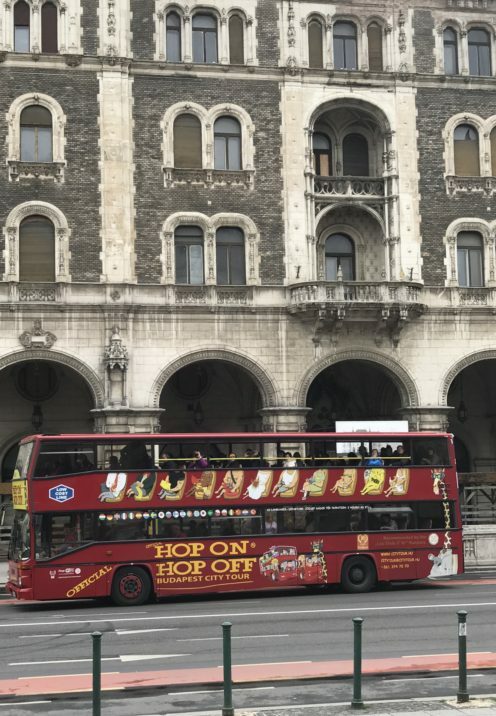 So, after a good night’s rest, we were ready to see Budapest and started by taking the convenient Hop-On, Hop-Off bus. 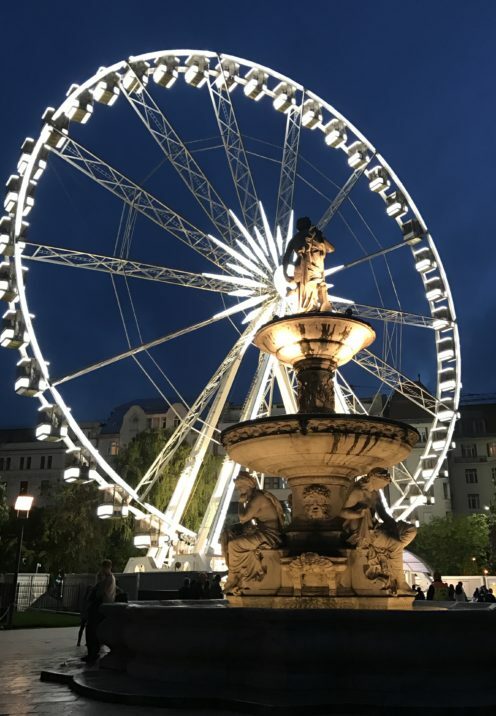 With its 2 loops and 16 stops made in about a 2-hour span of time, one can get a great overview of the city, making it an ideal introduction to one of Europe’s most beautiful cities. 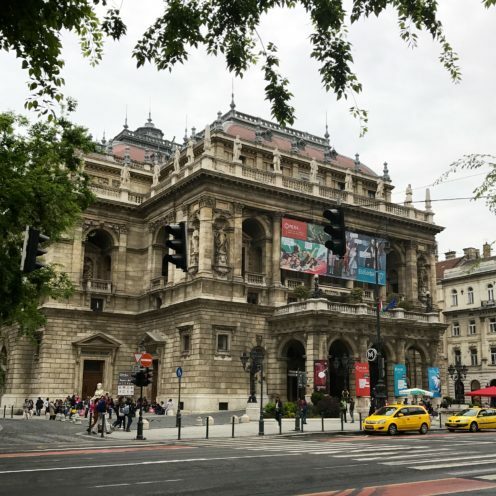 The tour highlights Budapest’s most famous attractions, so I suggest staying on the bus for one entire loop, then determine which stops merit a visit. 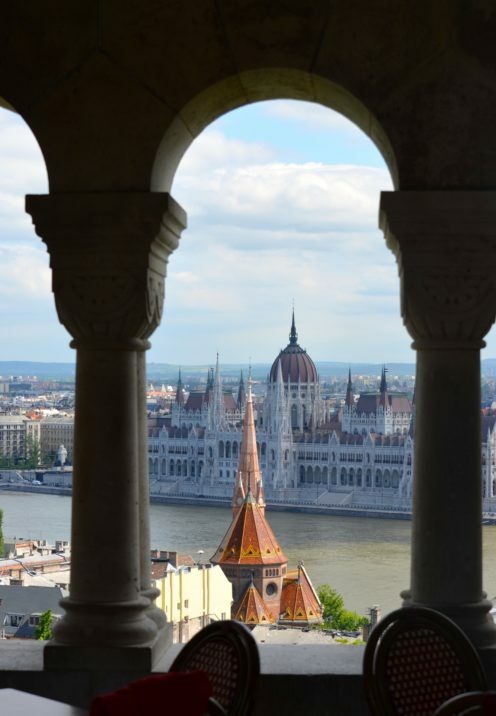 A good starting point is The Citadel, which offers amazing views of all of Budapest from the Buda side of the river. 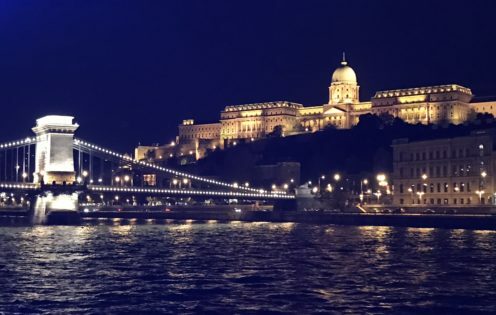 Budapest is actually 2 cities in one: Buda & Pest. 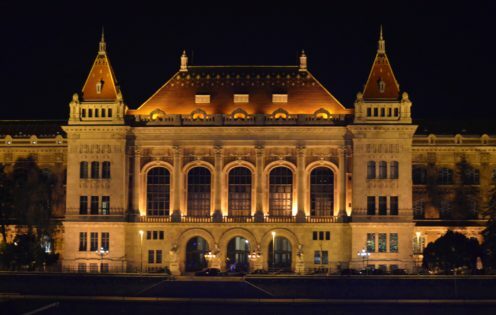 While in “Buda” you might want to spend a few hours in The Castle District. 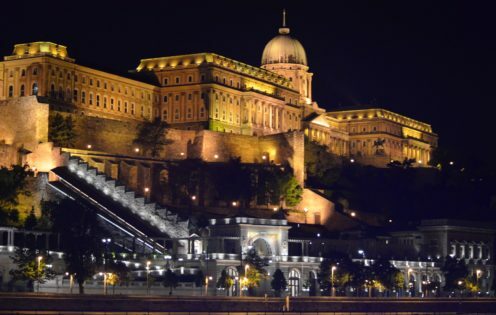 Buda’s sightseeing consists mainly of the very touristy and crowded Castle Hill, which can be seen in less than a day. Then the remainder of your time should be spent in Pest. So first, let me show you a bit of Castle Hill. 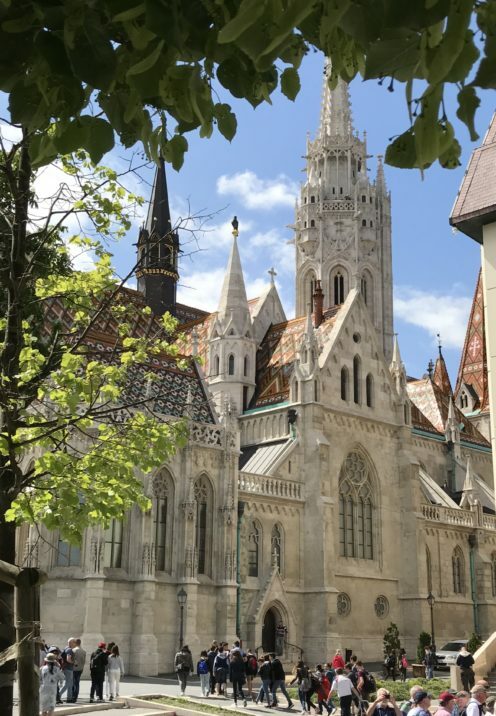 The crowning glory of Castle Hill is the Neo-Gothic style Matthias Church, arguably Budapest’s finest church inside and out. Cliffside in front of Matthias Church are the 7 pointy domes and ramparts of Fisherman’s Bastion. 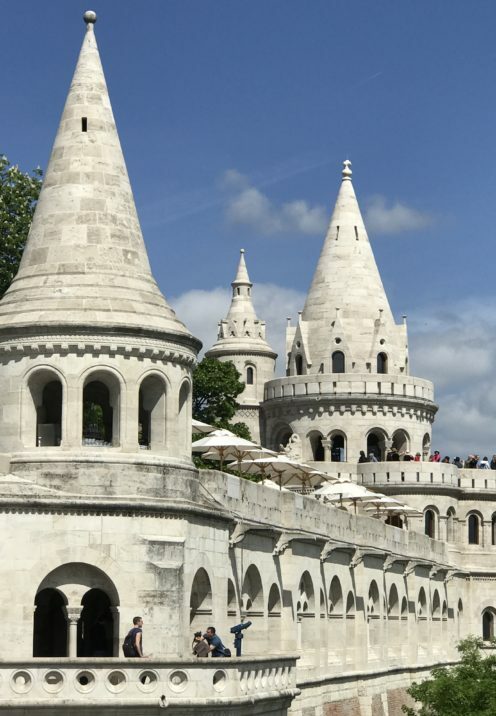 Newly built for the Millennium celebration honoring the 7 original Magyar tribes of Hungary, this fanciful, Disneyland-ish structure is a great way to take in the beautiful views of the city below. 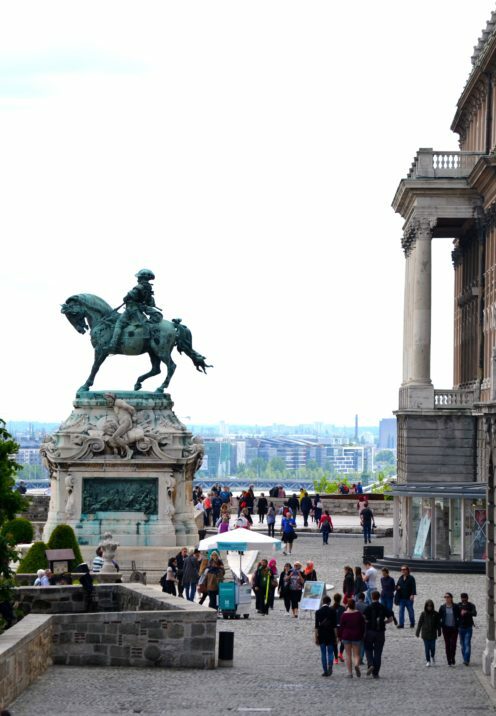 While you can pay to walk the ramparts to take photos, most of the structure can be explored for free, as we did, taking photos of the Pest panoramas thru the windows of the Bastion Cafe. 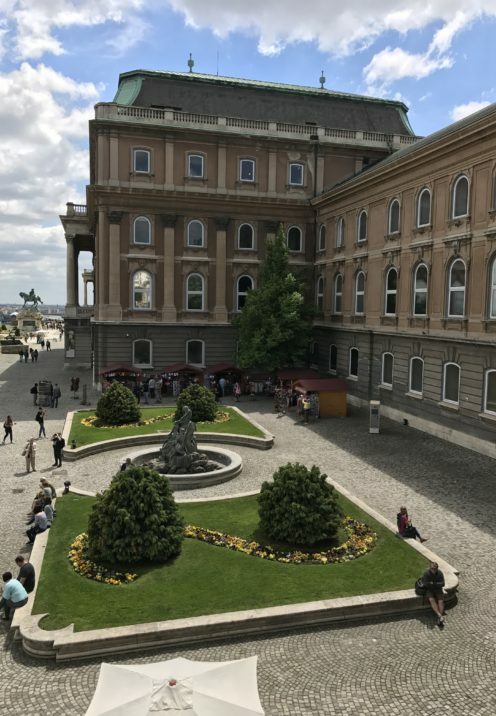 If you don’t mind walking a bit, from here stroll down to the nearby Royal Palace which houses 2 museums: The Hungarian National Gallery & The Budapest History Museum. 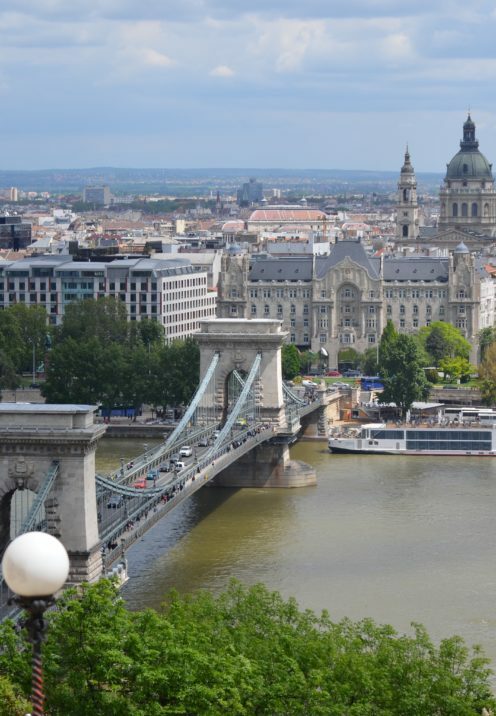 The terrace in front of the Palace offers more beautiful vistas of Pest, including the iconic and walkable Chain Bridge. 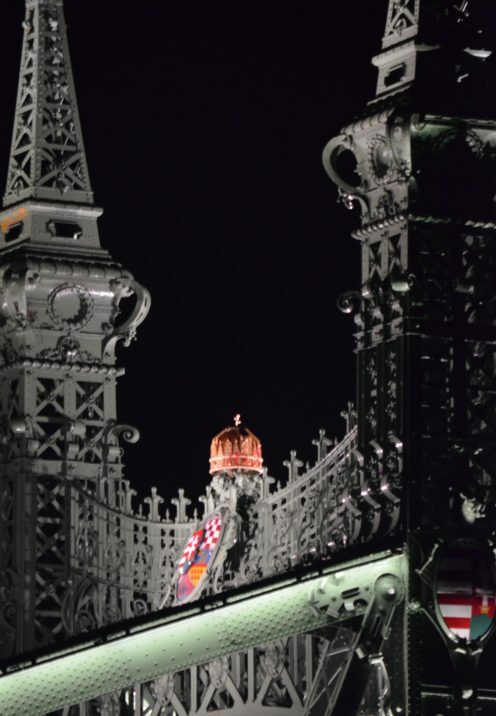 Guarded by lions, it’s Budapest’s most famous bridge and was the first permanent link between Buda and Pest. 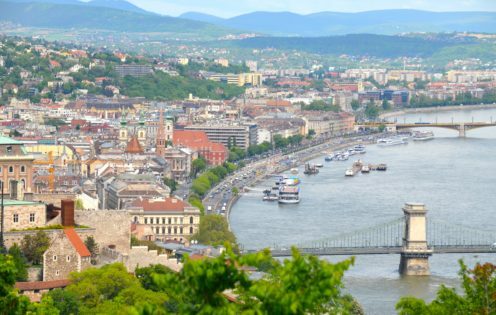 It’s an easy downhill walk from Castle Hill to the bridge below, where you can cross the Danube to begin your exploration of Pest. 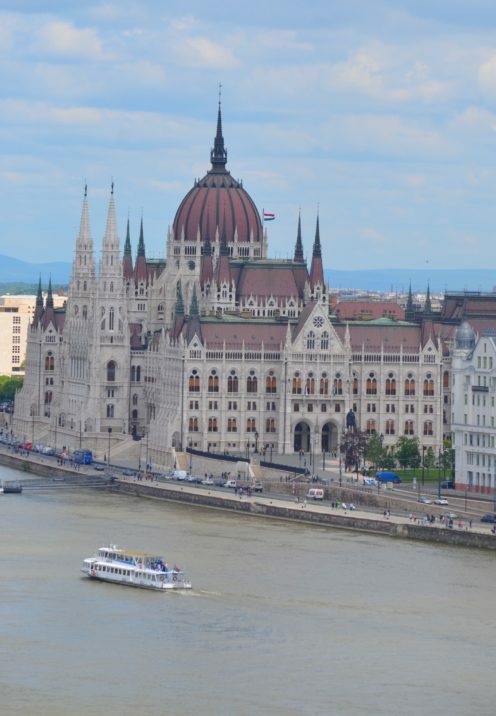 As you find yourself back in Pest, a left turn after crossing the bridge will take you along the river to the Hungarian Parliament building. This dazzling, Neo-Gothic building topped with a Neo-Renaissance dome is impressive and extravagant in design, both inside and out. Tickets that include a tour time sell out so purchase your tickets in advance online @ www.parliament.hu. 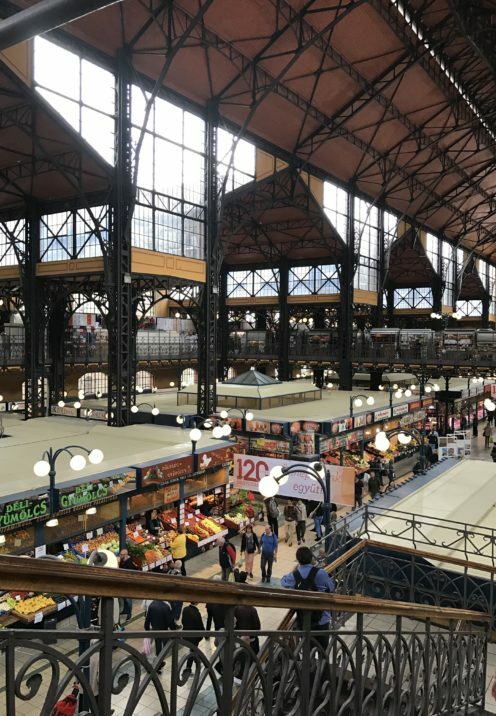 In the opposite direction along the Danube is the Great Market Hall, a place no visitor to Budapest should miss. This gigantic, 3 level market sells produce, meat, picnic supplies and every form paprika on the ground floor. 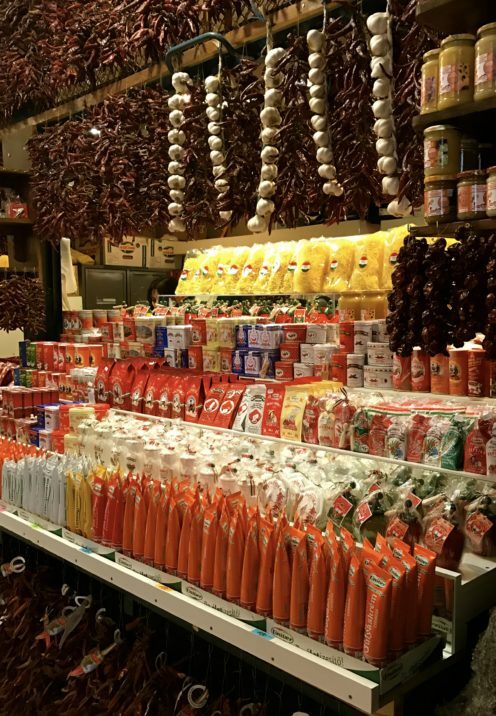 I went crazy purchasing Paprika, the quintessential ingredient in Hungarian cuisine. 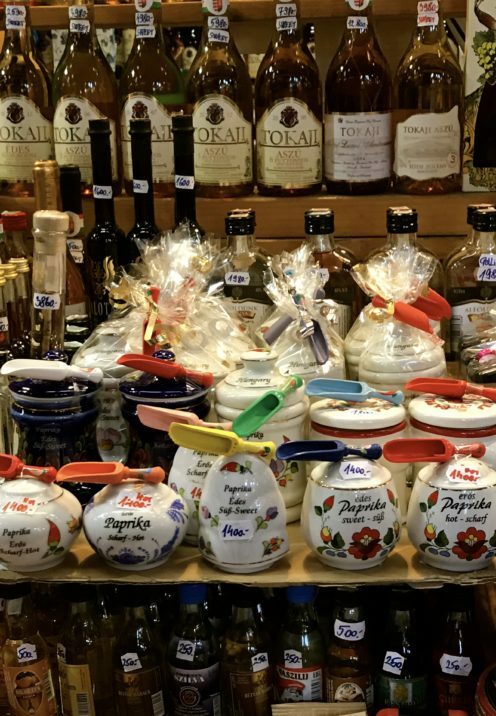 This iconic Hungarian spice, with more than 40 varieties, is sold in many degrees of spiciness and is packaged in colorful bags or ceramic containers with little wooden spoons. 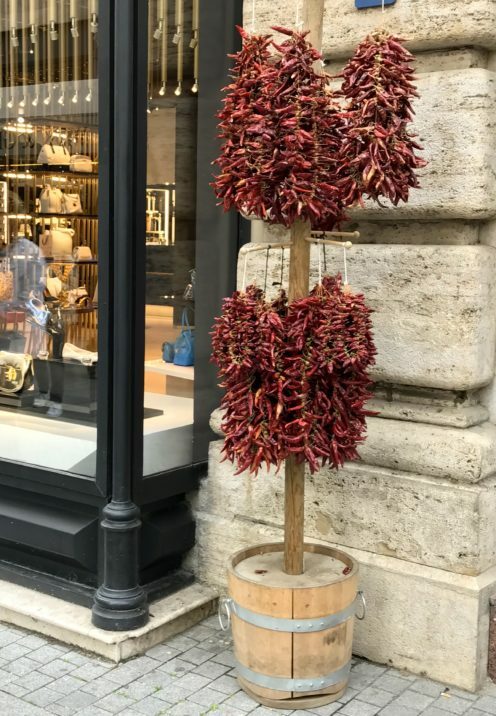 Easy to carry home, they made the perfect souvenir/gift. 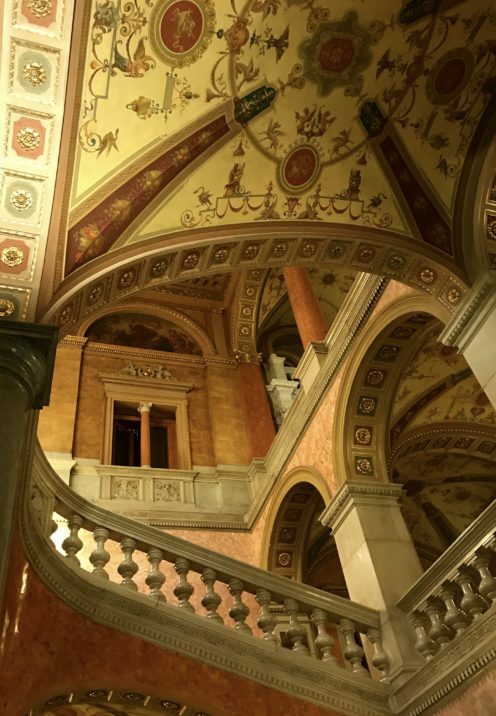 Not to be missed, the Hungarian State Opera House is considered to be one of Europe’s finest. 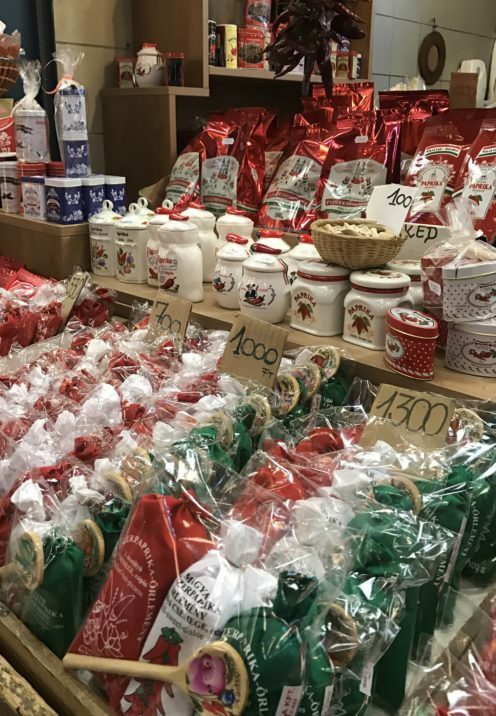 You can drop in whenever the box office is open to see the ostentatious lobby and visit the gift shop where I picked up some great gifts for my grandchildren. They also conduct 45 minute tours, taking visitors inside the lavish auditorium. Check times online and show up 10 minutes beforehand to buy tickets. 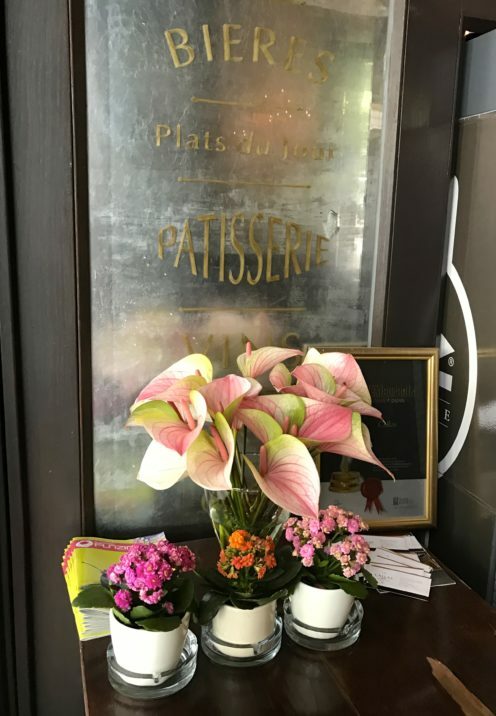 If you arrive during the lunch hour it’s possible to enjoy a meal at the attractive sidewalk Cafe attached to the Opera House. 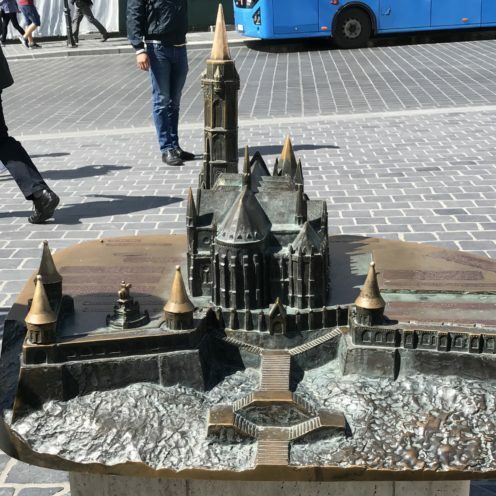 One of the stops on your Hop-On, Hopp-Off Bus tour will be Heroes’ Square. 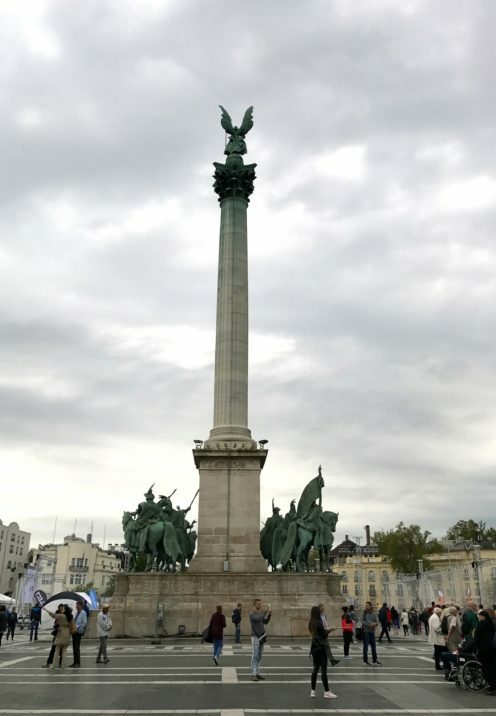 It’s a large square dedicated to the 14 Hungarian leaders who span the nation’s history. 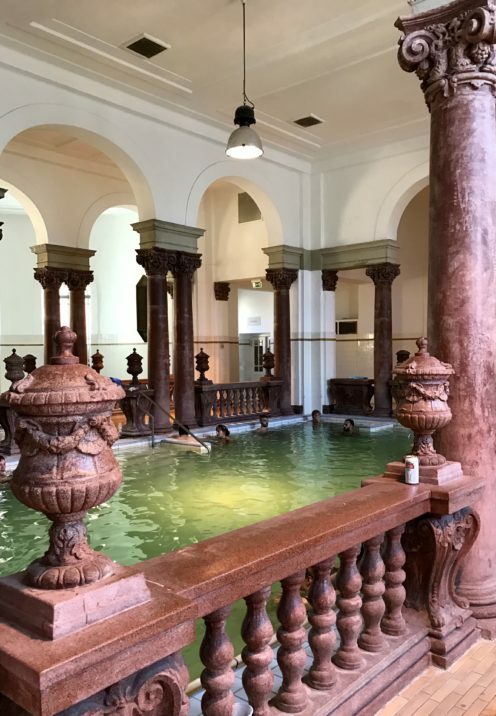 No visit to Budapest is complete without a visit to a thermal bath, as they are as Hungarian as it gets. 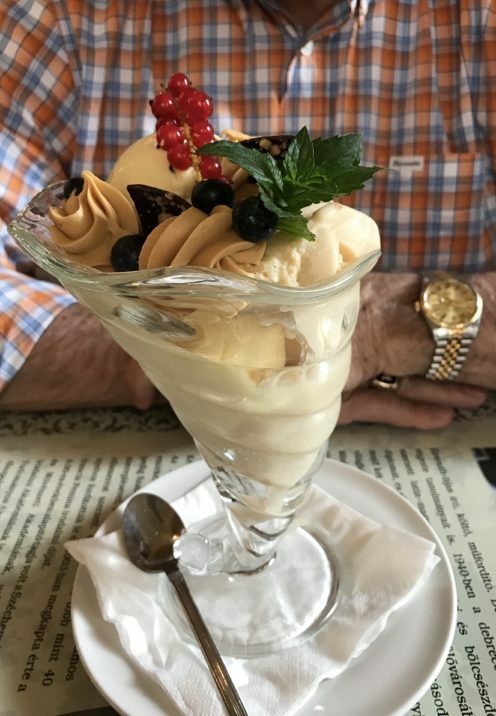 There are some 2 dozen but the most famous are Széchenyi and Gellért. 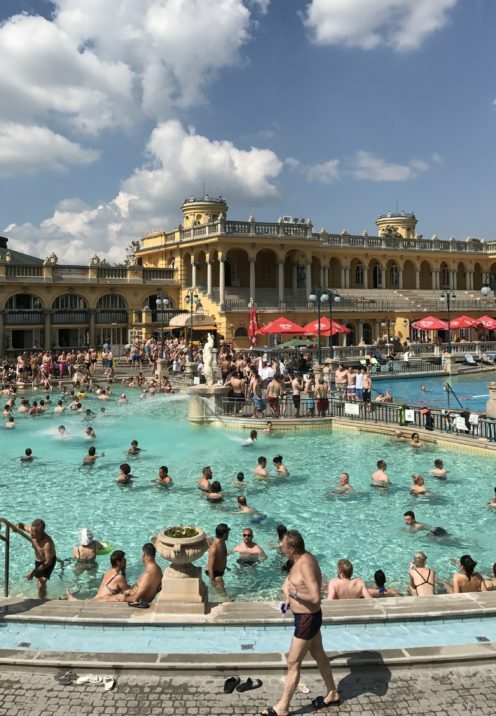 We decided on a visit to the Széchenyi Baths, where humans of every age and body type take the waters for both health and enjoyment. 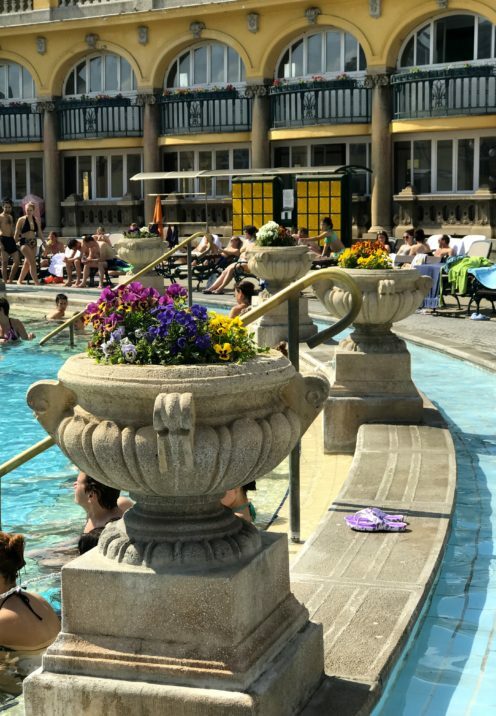 Admittedly I was a bit intimidated by the whole idea of soaking in 100-degree thermal baths with Speedo-clad Hungarians, but after successfully navigating the somewhat difficult-to-figure-out entry process, Brad and I had a lot of fun bouncing and giggling our way around the pools. 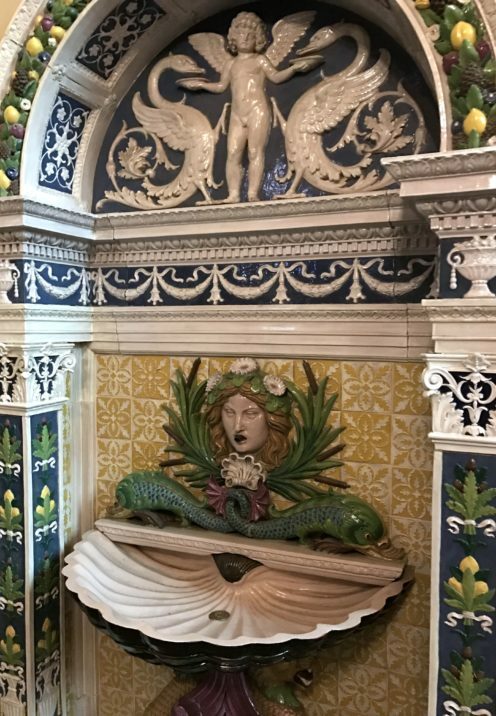 Brad, being much braver than I, waded into this indoor thermal bath of green mineral water, said to have healing properties. Savvy Hungarians avoid the cost of admission by getting a prescription for the baths, massage included, from their local doctor. 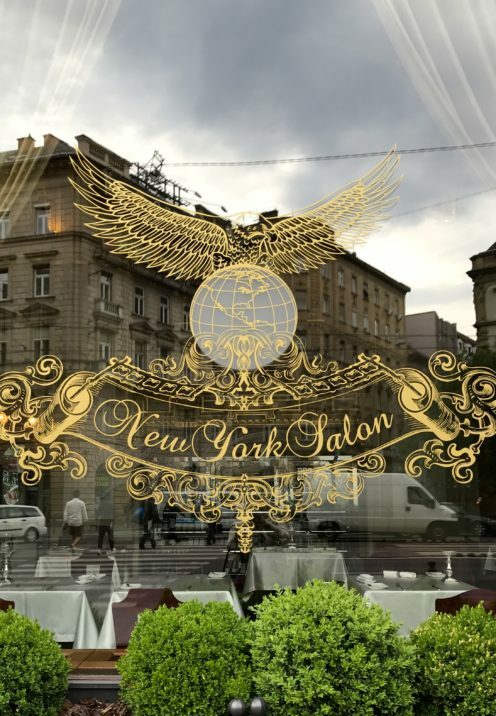 Cafe Culture at its best can be found at Budapest’s most over-the-top coffeehouse, the New York Cafe at the Boscolo Hotel. 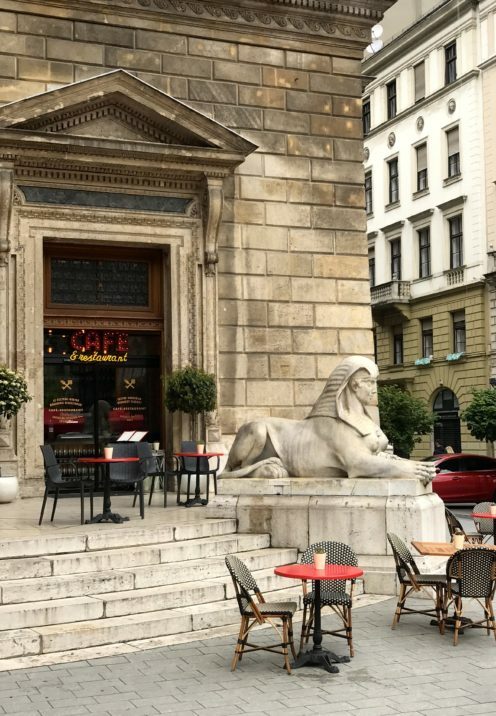 Worth every penny of a pricy cup of coffee, every visitor to Budapest should pay a visit to this impressive old building. 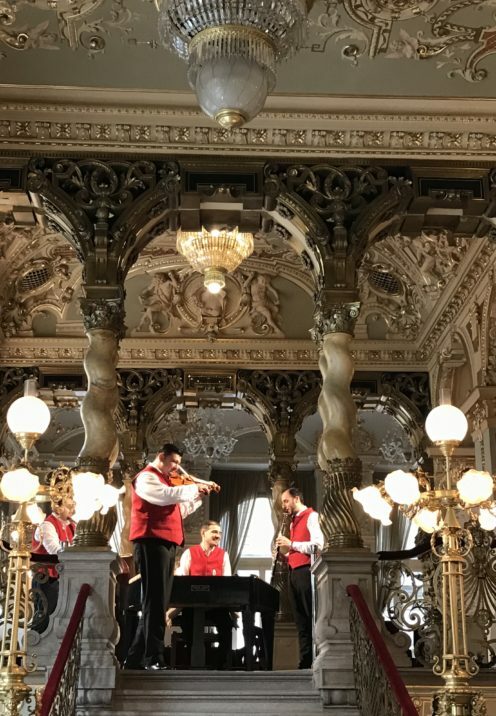 Musicians serenade Cafe goers with lively music while waiters provide quick and professional service, if for no other reason than to keep the tables turned with the steady flow of visitors. 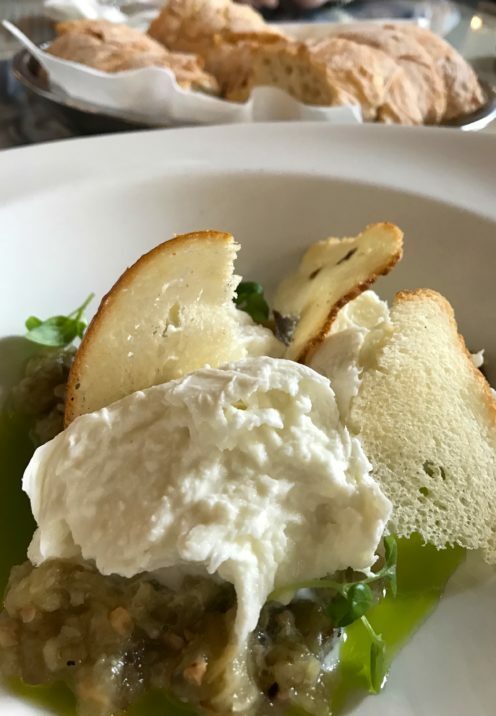 and I indulged in this absolutely delicious Burrata & Eggplant, do-it-yourself Bruschetta. Accompanied by a huge basket of delicious fresh bread, I really enjoyed my meal. 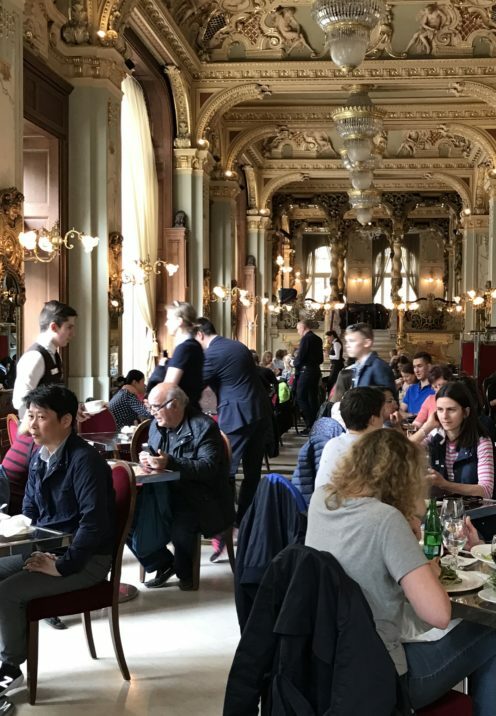 The quality of the whole experience, from the ambiance, to the service, to the food, was spot-on-great, surprising for what is without a doubt one of the biggest tourist experiences in Budapest. 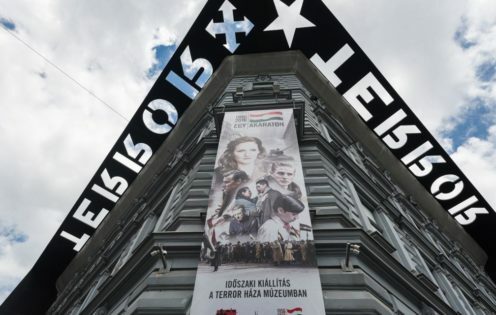 The House of Terror was once the headquarters of the Arrow Cross Party, the Hungarian Nazis, between 1944 and 1945. Opened in 2002, the museum is now a monument to the memory of those held captive, tortured and killed in this building. 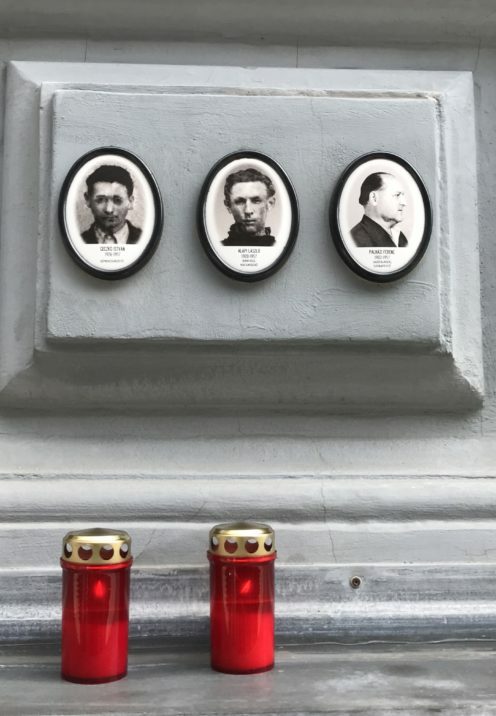 Self guided tours with headset narratives give one a very good explanation of Hungary’s darkest era. 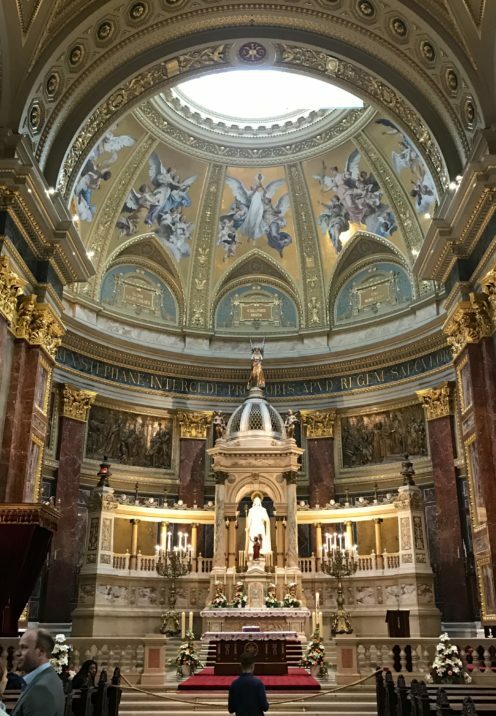 St. István’s Basilica is Budapest’s biggest Church and is one of the city’s top landmarks. 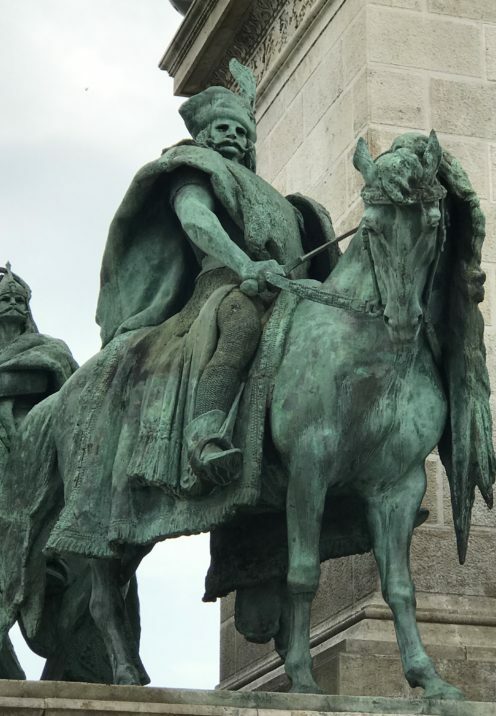 It celebrates St. István, Hungary’s first Christian king. Many tourists take the elevator to a panorama terrace at the top of the church’s dome for what are said to be great views of the city. 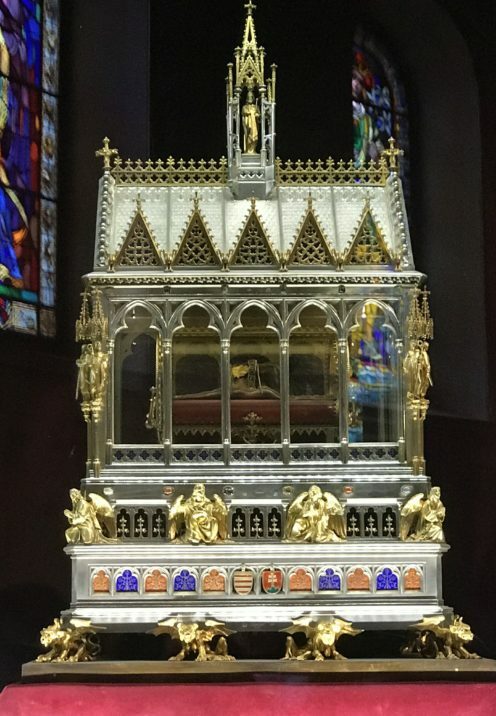 On display here is the blackened and withered, 1,000- year-old king’s hand, contained in the gilded reliquary shown below. 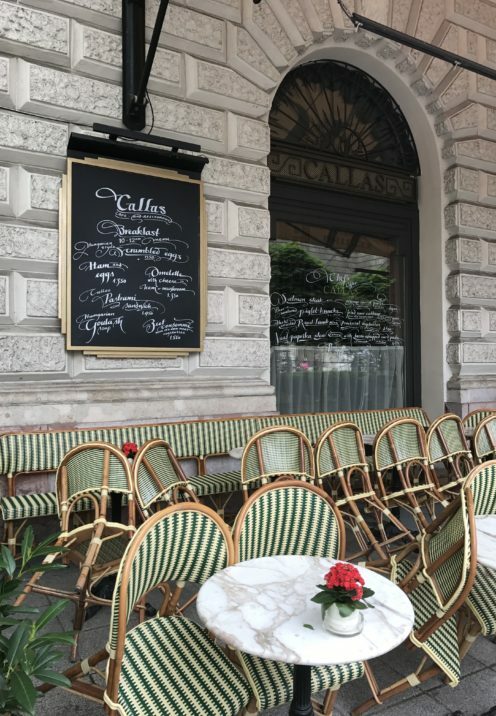 Andrássy Street is Budapest’s most elegant, grand boulevard and is lined with lovely shops, theaters, cafes, museums and has great people watching too. 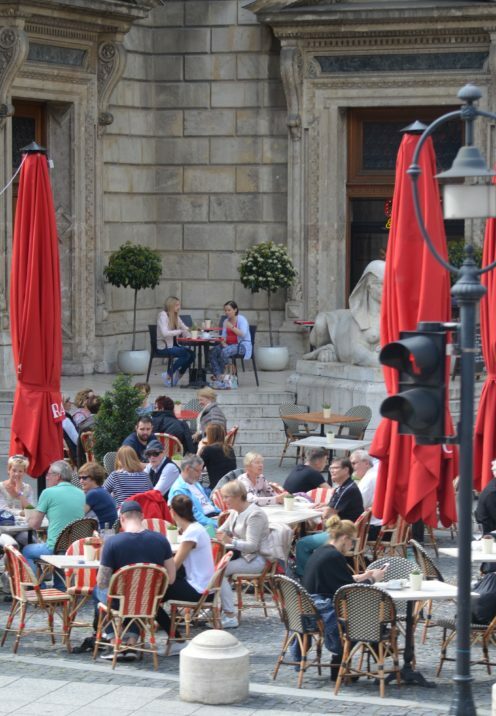 Rick Steves called it the Champs-Elysées and Broadway rolled into one. 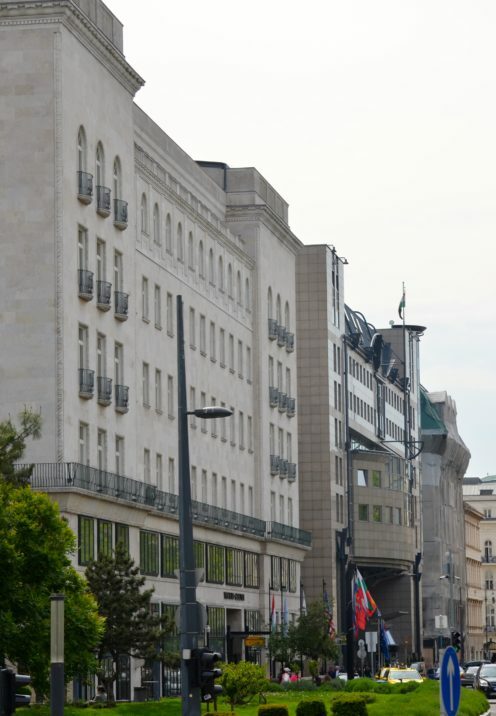 Along this street you’ll find the Opera House and the House of Terror, as well as City Park and Hero’s Square. Here are a few of the sites along the way. 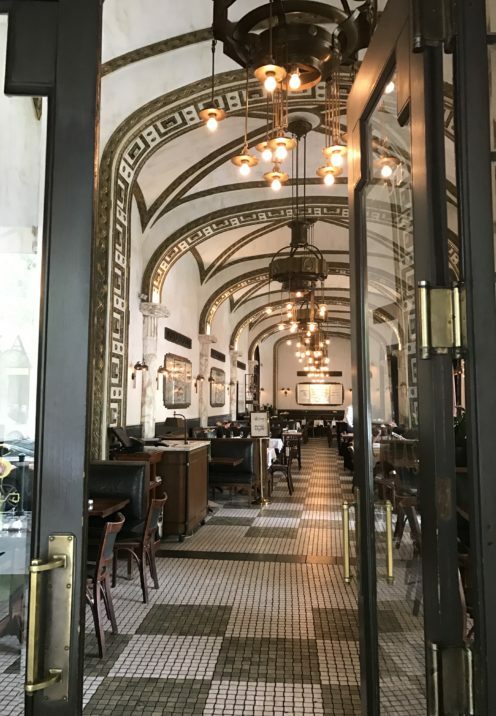 Not far from our hotel, The Ritz-Carlton Budapest, is Király Street. 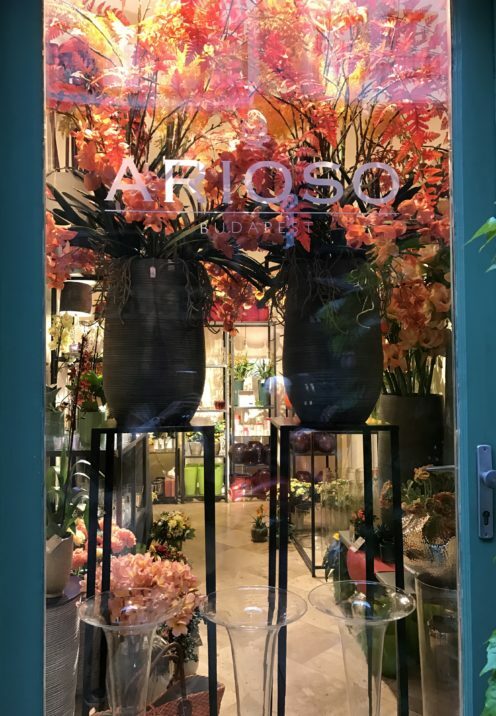 While walking it we happened upon this magnificent floral and interiors shop, Arioso. 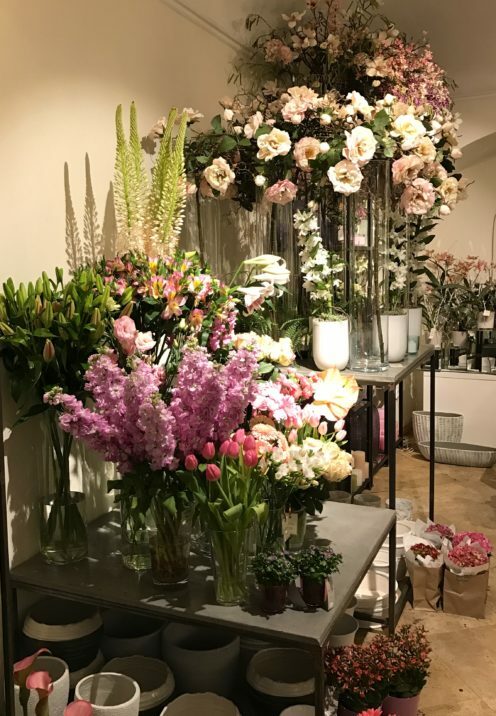 If you are nearby it’s worth a visit to this emporium of floral beauty. This grand city is bathed in floodlights at night. 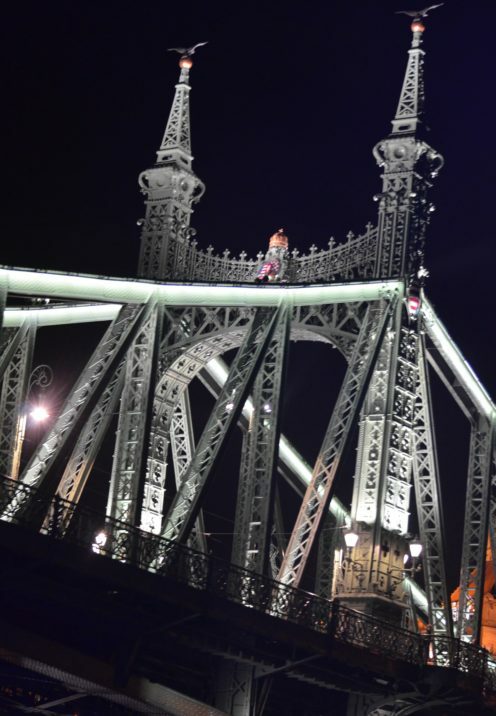 Set out on foot to explore the illuminated city or take a nighttime boat ride on the Danube, but don’t miss this other City of Lights at night. 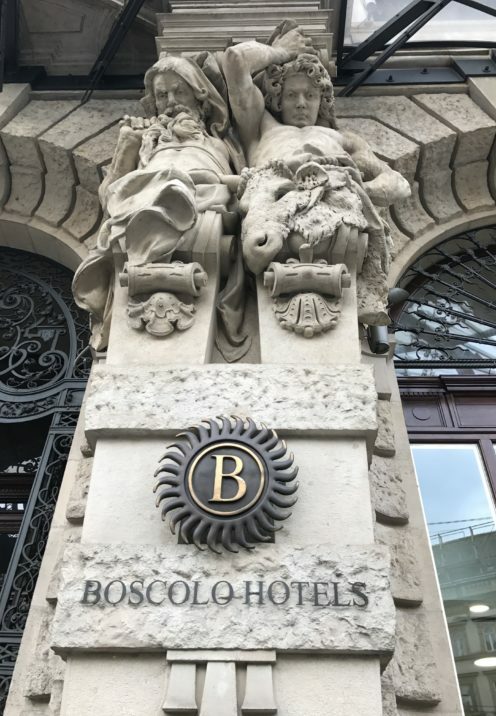 There is a great deal to see in Budapest so we dedicated a full 4 days to seeing this city and still failed to do it all. 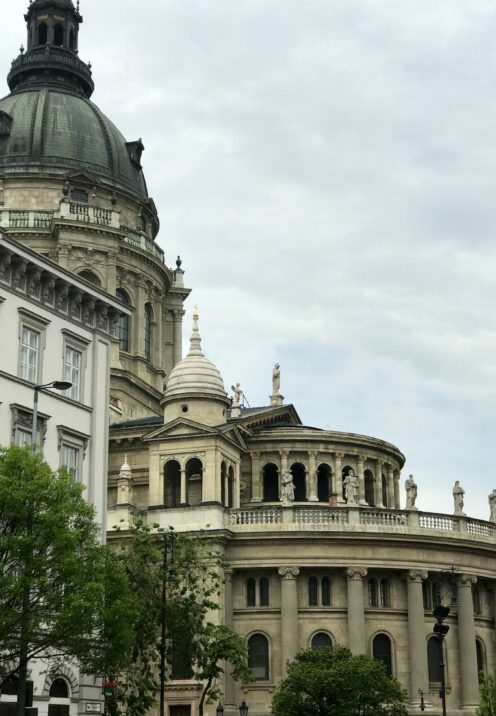 We missed the Jewish Quarter, which from the Hop-On, Hop-Off bus looked interesting, and the Great Synagogue can be toured and is supposed to be beautiful. We also failed to see the Hospital in the Rock, an underground network of hospital and bomb-shelters from WWII & The Cold War. The stately old Art Nouveau building known as Gresham Palace now houses The Four Seasons Hotel. Friends said a stroll through the luxurious lobby and a drink at the bar was not to be missed but somehow, to my regret, we did. 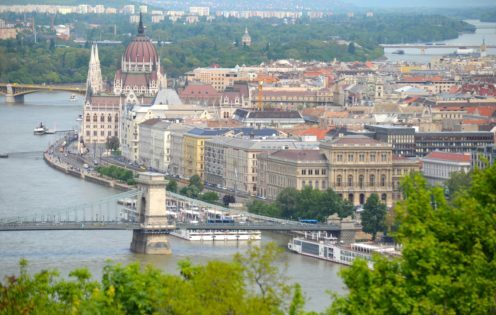 We found Budapest to be cheaper than most Western European capitals. The tourist season is May to September. 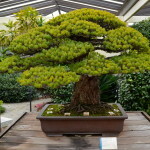 We visited in May when the weather was mild and the crowds were reasonable. Most Hungarians speak excellent English. That’s because no one outside of Hungary speaks Hungarian, a very difficult language that is not related to any other language. 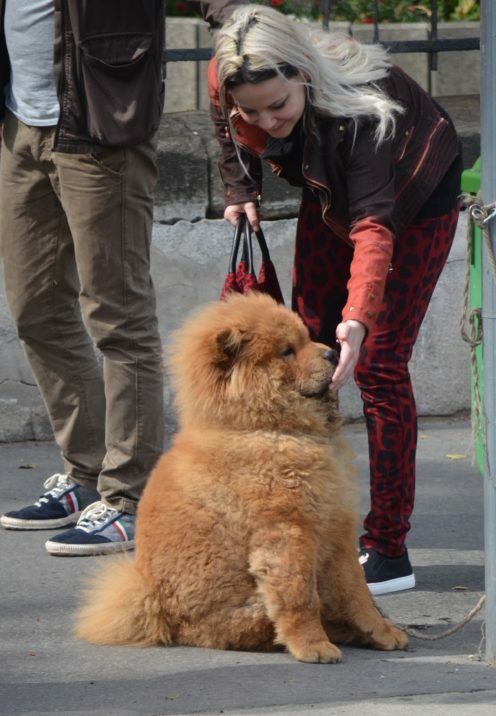 We found the people to be extremely friendly, pleasant and helpful. 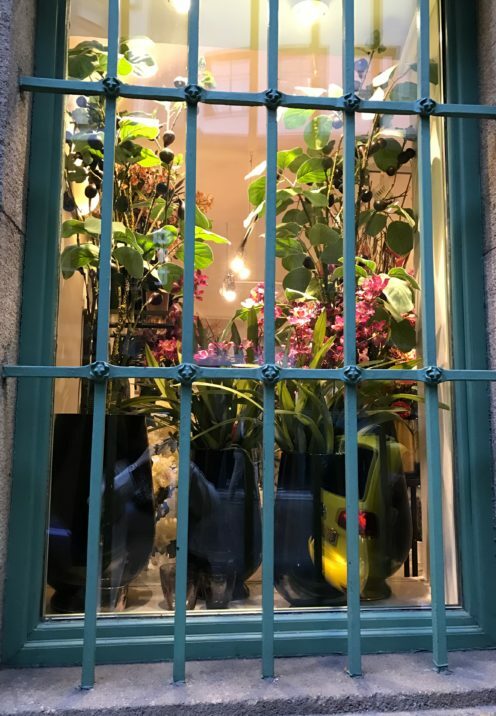 We also felt very safe exploring the city both by day and by night. 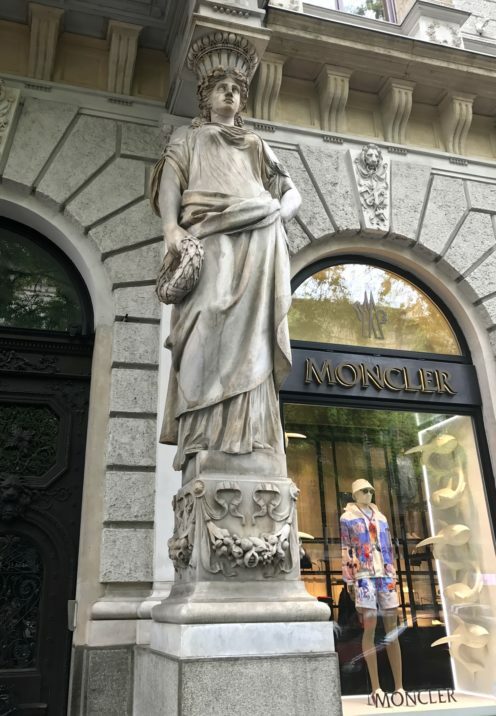 We read in Rick Steves’ book on Budapest about the notoriously unscrupulous cab drivers in Budapest and at first were reluctant to flag a taxi off of the street. But after a long chat with a great taxi driver, we learned to simply make sure that any taxi we got into was painted yellow & black, had a meter and was affiliated with a designated cab company, as many are independent and untrustworthy. We also used the underground Hungarian Metró which was a fun way to travel like a local. 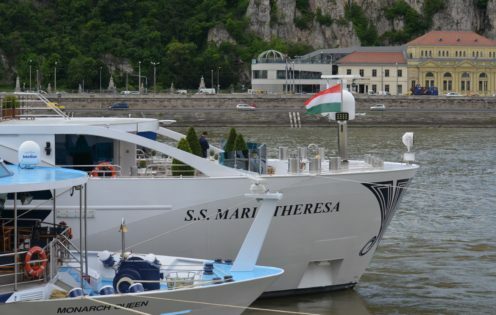 Please stay tuned and in my next travel blog post I’ll be taking you with me on a 7 day cruise down the Danube River aboard the magnificent Uniworld Ship, the S.S. Maria Theresa.